Only Parent Chronicles: What to Do With All of That Candy?!?! What to Do With All of That Candy?!?! This year, however, that will NOT be the case. Why, you ask? Because if there is one thing The Girl likes better than candy, it's MONEY!!! It was brought to my attention early this week that there is a really SWEET program called Halloween Candy Buy Back. This program buys candy from kids under the age of 12 for $1 a pound (up to 3#)!!! How sweet is that! In the Twin Cities area, where I live, Metro Dentalcare is hosting this program at 13 of their locations! The buy back will run on Monday, November 2 from 4p.m. - 7p.m. In addition to buying candy from your shorties, Metro Dentalcare will be giving out free toothbrushes, toothpaste, and educational materials to promote dental health! (Did you know that cavities are the most prevalent disease in American children today!!! Yikes!) The candy purchased by Metro Dentalcare will donated to three separate charities - Operation Gratitude, which sends care packages to soldiers serving overseas, Second Harvest Heartland, a local food bank that supplies food to food shelves in Minnesota and Wisconsin, and The Harriet Tubman Center, a shelter in Minneapolis. When looking into the national program, I discovered that dental offices around the country are doing the same thing on the same day and donating candy to very similar types of organizatons. By going to http://www.metro-dentalcare.com/, you can find the 11 participating locations in the Twin Cities. Or if you don't live in Minnesota (I know a lot of you don't), you can go to http://www.halloweencandybuyback.com/, enter your zip code and find a participating dentist near you! I'm so excited for next Tuesday! My kids and I will DEFINATELY be participating! Maybe, finally the post-Halloween candy wars won't ravage my home!!!!! Halloween truly is one of the BEST holidays, you are SO right!!! What a cool idea! I'm going to link to this tomorrow from singlemommyhood.com. Thanks!! What a great idea!!! I'm usually the one eating all the candy. I'm not sure I can part with ALL of it, but I will definately look to see if there is a program around here. That's awesome. I am going to try it with my kids. That is a great program!!! That's an awesome idea. I hadn't heard of it before. Would've come in handy in a household of diabetics! See I thought you were going to say that you were buying the candy from your kids. This is even better! What an awesome program. I will check to see if my community is participating. Our dentist in town does that. Although he never says where it goes. I personally think he eats it. And I love candy too much. I can't part with it. I'm selfish like that. I've already eaten half the bag that we bought for trick or treaters. That's why I usually buy the yucky stuff; the bargain bag of suckers. But my husband went shopping this time and bought whoppers and kitkats and reeses and hersheys and almond joy and oh, oh, YES! YES! YES! Sigh. Makes a girl happy. I actually buy the candy back from my kids (three boys) at 10 cents per piece of candy. 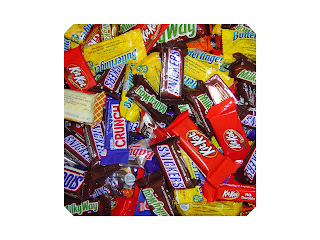 A package of candy is considered a single piece - so large or small is still only 10 cents apiece. I end up minus about $20 at the most, and my kids don't eat all that sugar! I'm sorry, but that is actually really stupid. If you don't want your kids to eat a lot of sugar, why don't you just not take your kids trick or treating or do a very minimal handful of houses? Candy is not cheap, an average family spends an upwards of $50-100 on candy for the neighborhood and you are just gonna give it away for $1? What a waste. Try a dentist in minneapolis they did a great job for me.